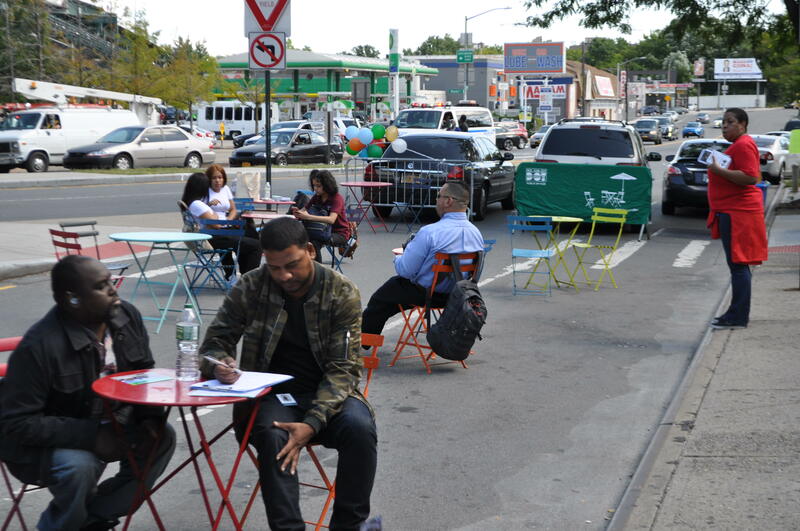 In case you missed it, back in September we had a One Day Plaza Event on the slip lane between Westchester Ave and E Tremont. It was great to have community members enjoying the additional public space. We had a DJ, balloons, tables & chairs, and food samples to celebrate with students the opening of a new school year. If you're part of the community make sure your voice is heard and participate in our survey and stay tuned for information about our next community workshop! Comments made by the public to the Projects and Initiatives site are reviewed and, while comments will not be edited by NYCDOT personnel, a comment may be blocked if it violates the comment policy described here. Comments should be related to the posted topic or specific project. The Projects and Initiatives website is not meant for comments that do not directly relate to the purpose or topic of the specific project. For general comments or communications concerning an agency, please contact the agency's Commissioner on www.NYC.gov. For service requests, please contact 311 Online. You are subject to the Terms of Service (TOS) of the host site. Content you share with or post to the Projects and Initiatives website is subject to the TOS of the host site and may be used by the owners of the host site for their own purposes. For more information, consult the host website's TOS. The Projects and Initiatives website is not open to comments promoting or opposing any person campaigning for election to a political office, or promotion or advertisement of a business or commercial transaction. The use of obscene, threatening or harassing language is prohibited. Personal attacks of any kind or offensive comments that target or disparage any ethnic, racial, age, or religious group, gender, sexual orientation or disability status are prohibited. Comments advocating illegal activity or posting of material that violates copyrights or trademarks of others are prohibited. This comment policy is subject to amendment or modification at any time. Users are welcome to submit or post content to an official New York City site where the agency allows users to post content, the content meets the standards articulated in this Customer Use Policy and pertains to the subject of the social media site. Users may only post their own, original content. Reproduced or borrowed content that reasonably appears to violate third party rights will be deleted. To request a reasonable accommodation when accessing New York City social media sites, please contact NYCDOT’s ADA Coordinator by calling 212-839-6428 or emailing accessibility@dot.nyc.gov. Questions or concerns regarding NYCDOT’s Projects and Initiatives activity, NYCDOT’s Projects and Initiatives Site Policy and/or this Customer Use Policy should be submitted online.